If there is anything I’ve learned from this summer, it’s that grilling and/or roasting fruit is an excellent idea (I hope I’ve learned more than that this season, but you know, I’ll take what I can get). Grilled watermelon? Come to mama. Grilled peaches? Total treat-yo-self business. Roasted strawberries? Uh-huh times a trillion. But I digress. Because what I’m really here to tell you today is that roasted blueberries are and forevermore shall be one of the tastiest things to come out of my kitchen — second only to roasted blueberry malted milkshakes, that is. This is serious deliciousness, you guys. These milkshakes don’t mess around. First you roast up some blueberries just until they burst — which, by the way, have now mixed with the sugar in the oven and have transformed into a light syrup that will blow.your.mind. Then, you combine them with a cup or so of Yoplait’s new Greek Frozen Yogurt Blueberry (equally mind-blowing, as are their other flavors), milk and malted milk powder and with a few pulses of the blender, you have a milkshake of epic proportions. Oh, and I did I mention this thing is healthy, too? Totally a good excuse to drink one or three of these in a day, as I may or may not have done (I did). Of course, the blueberries play really nice with other fruits, so if you feel the need to add grilled peaches or roasted strawberries to the mix, I am all over that. Be sure to invite me over if you do, though, OK? Because I seem to be all out of milkshakes over here (might have something to do with the aforementioned drinking of several of these in one day, I don’t know). 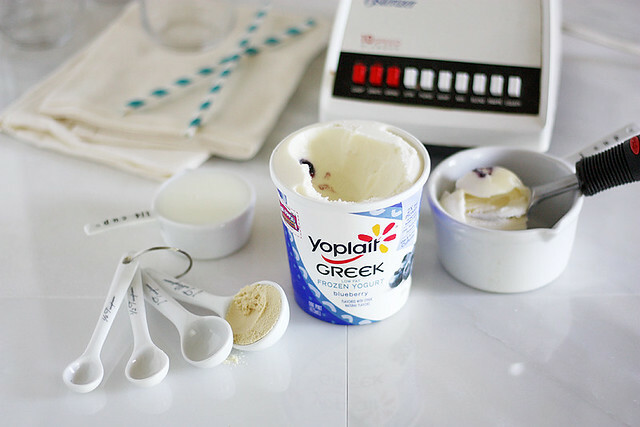 Roasted fruit + Yoplait Greek Frozen Yogurt + malted milk powder + milk = A very good idea. Do it. Heat oven to 450°F. 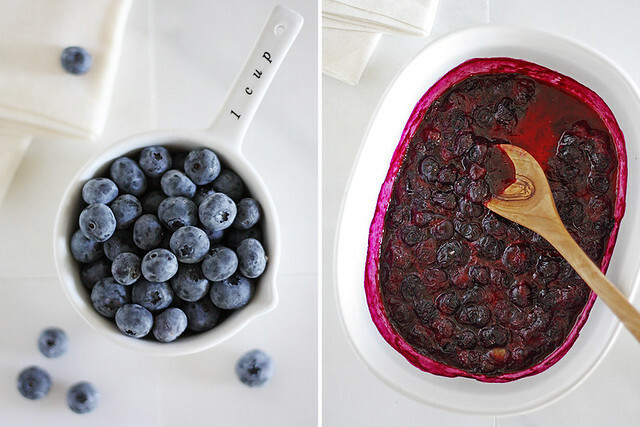 Toss blueberries with sugar in a shallow baking dish. Roast 10 minutes, stirring occasionally, just until berries burst. Transfer to a bowl and cool in freezer 10 minutes. Place Yoplait Frozen Yogurt, milk, malted milk powder, cooled roasted berries and 2 to 3 ice cubes in a blender. Blend until thick and smooth. 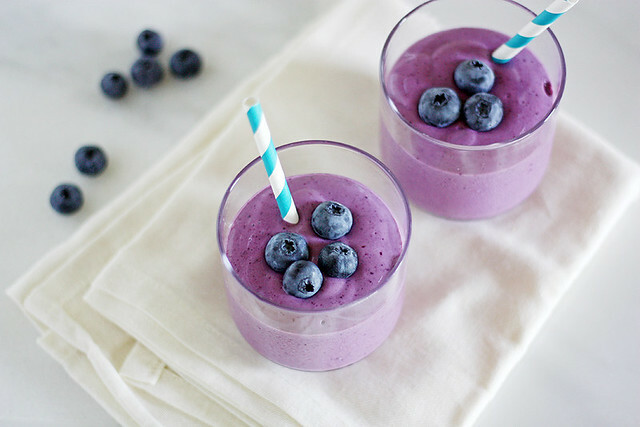 Pour milkshakes into two glasses; top with more blueberries and serve. Disclosure: I received compensation from Yoplait for recipe development purposes. All opinions are my own. Aww man! I seriously need more malt in my life, and this looks heavenly!! 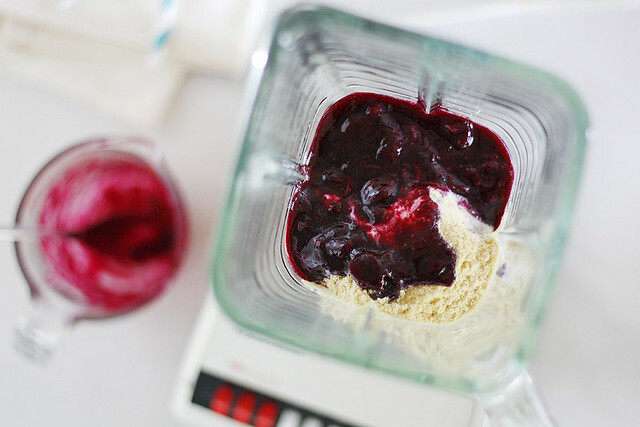 As if the roasted blueberries weren’t good enough, you turned them in to a milk shake. Holy yum!! I need this! FREAK OUT moment. I have to have these. Like, tonight. Also, I love that you included malt powder. Malts are totally under appreciated and the malt powder makes any shake that much more amazing. Cheers girl. The color is stunning! I definitely need to try roasting blueberries now. And I love how you used Greek frozen yogurt. That must add such a nice tang. I love the vibrant color! Malt powder is a great touch to these shakes. Katrina — One cannot have too many malts. 😉 Thanks, lovely! Steph — Ha! I did. 🙂 Thank you, dear! Erin — Malts just don’t get the love they deserve, ya know? 🙂 Hope you love this! Megan — You definitely should try roasting blueberries; it brings out this amazing rich flavor that works fantastically with the tartness of the Greek froyo. Hope you like it! Consuelo — Oh, definitely “best treat ever” status, for sure. 🙂 Thanks! Jamie G — Thanks so much! I know how to start my day now! This looks LOVELY!!!!!!!!!!!!!!! Samina — Yes! Best morning treat, ever. 🙂 Thanks, dear! These look delicious! We have had some malt powder in our cupboard for ages and this recipe would be a fantastic way to use it. And, I love that this recipe uses Greek yogurt so it would fill you up, as well. Thanks for sharing! OMG YUM! I want one right now. Great ideas here! I just realized this summer, while eating blueberry pancakes, that I really prefer cooked blueberries to raw. Also, I love anything malted (but I knew that long before this summer). I’d say this is a very very good idea… Yummy! Erika — I’d have to agree. 🙂 Thanks, lovely! I am down right in love with this shake. Those roasted berries are calling my name. I’m pretty sure this is why I have a pint of blueberries in my fridge right now. Billy — It’s fate. DO IT. I am with you on roasting fruit. So so good! These milkshakes look insanely good! Roasted blueberries?! AMAZING. And love that they have malt powder! Anna — Isn’t roasted fruit amazing? Thank you, dear! Monica — Thank you, friend! I am so glad you roasted up some blueberries and discovered their amazingness!! Blueberries have been my berry of choice this summer and I have been roasting them daily for muffins and yogurt, but never for a milkshake. How did I not think of that!?! This looks and sounds amazing and I cannot wait to give it a try with what I have on hand tomorrow. So excited! You had me at malt. Or blueberry. Or roasted. I don’t know-it just looks very, very good! Shut the front door. No, actually, open it and hand me a milkshake. Gorg, I love the roasted blueberries! Tieghan — I’m so glad you discovered them, too! I’ll have to try them in muffins and yogurt now — YUM. 🙂 Thanks, gal! Laura — Thank you, friend! Whhaaaa?! Malted and made with roasted blueberries?! I think this is milkshake heaven. Oh yum! I could have this for breakfast, lunch and dinner – ooh and snacks in-between too! This shake sounds and looks fantastic! Thanks for the tip about the roasted blueberries! Absolutely love these! I’ve never thought of roasting blueberries! Laura — Thanks so much, doll! Shashi — I like the way you think 🙂 Thanks! Jessica — Oooh, it’s good stuff. You have to try it! Thanks, dear! The color of the roasted blueberries malted milkshakes here is so vibrant. Just beautiful. I bet my guys would love this if I make it for them as a surprise. These look amazing!! 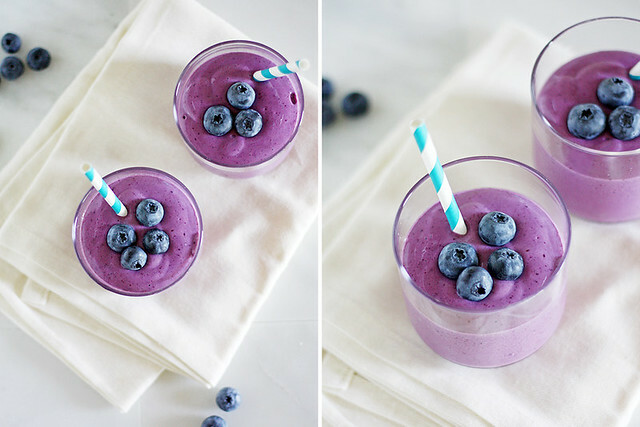 The roasted blueberries sound so so amazing in a smoothie – yum! These look DELICIOUS! 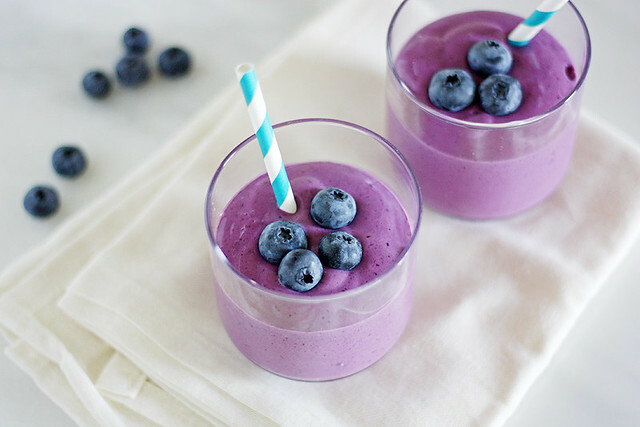 I’m just starting to like blueberries in desserts so I think these milkshakes would be a great way to add more blueberries to my diet! I also just found your blog through a comment on the Curvy Carrot. I am in love with your blog. I want to make everything..
Sara — Oh, thanks so much for stopping by! And yes, blueberries in dessert is a weakness of mine: I can’t stop eating them. This looks awesome! 🙂 Healthy and refreshing. Surely will try. The snaps are wonderful. The time and hard work put into this is remarkable. Many thanks for sharing. These are the best color ever! Love the idea of malted blueberry goodness! You just know it! I’m going to try one tonight. Thankyou.